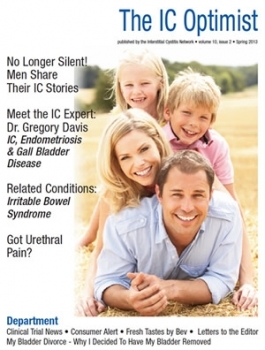 (1) No Longer Silent: Men with IC Share Their Stories - Last Fall, the ICN wrote a heartfelt letter to the men with IC who were vindicated when a RAND epidemiological study determined that up to 4 million men in the USA have symptoms of interstitial cystitis. Simply put, they had been ignored, demeaned and insulted by various medical care providers, family members and friends who suggested that they just be a man, ignore the pain or that it was all in your head. Within hours, our e-mail was filled with touching thank you letters and poignant personal stories. I knew that these stories deserved to be shared. Consider it the largest Letters to the Editor column youve ever read. Our thanks to these wonderful, honorable and deserving men. 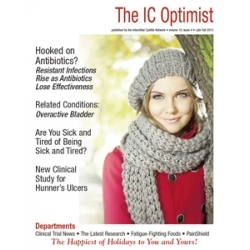 (2) Meet the IC Expert: Dr. Gregory Davis on IC, Endometriosis & Gall Bladder Disease - Dr. Greg Davis, a gynecologist in California, contacted the ICN after reading our last issue to discuss the role of hormones, endometriosis and IC. In his large IC practice, hes made some fascinating observations of teens with IC that I thought were worth sharing. 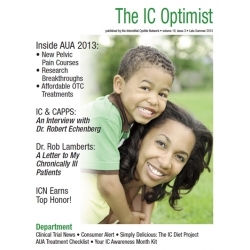 Hes also tracking a surprisingly high incidence of acalculous cholecystitis in many IC patients. If youve struggled with gall bladder disease, youll find his interview a fascinating read. 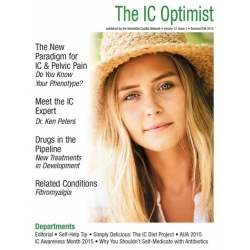 (3) The Latest IC Research - We share the results of six new research studies, including sacral neuromodulation, BOTOX-A, hyperbaric oxygen therapy, pelvic pain in younger patients, the combined use of hyaluronic acid and chondroitin and an unusual study that found that sleep apnea appeared to increase the risk of developing IC. (4) Related Conditions: Irritable Bowel Syndrome - We cover Irritable Bowel Syndrome, the most common related condition to IC. The connection between the various pelvic pain disorders is baffling until you consider the role of the nerves. They all end up at the spinal cord where those nerve impulses are delivered to the brain. Is that the connection? (5) Clinical Trial News: TARIS® Announces New Clinical Study of LiRIS® in Interstitial Cystitis - Taris Biomedical has launched a new clinical trial for LiRIS, a medical device that generated a lot of excitement last year when an early study found that it was healing Hunners ulcers. (6) Self-Help Tip: Got Urethral Pain? - Long time ICN member and blogger Melanie Bragen shares her personal journey with bladder removal. An active patient, she consulted with several doctors, tried every therapy available and then researched her options thoroughly before making the decision to have this life changing surgery. (7) Fresh Tastes by Bev: It's Salad Season - If youve missed having a salad, IC author Bev Laumann shares tips on how to create a healthy, IC friendly salad! It can be done! Really! Yes, really! (8) Introducing MultiRight Multivitamin Complex -The first low acid multivitamin formula that we hope will be more bladder friendly for patients who have found traditional vitamins irritating. PLEASE NOTE THAT YOUR DOWNLOADABLE FILE LINK WILL BE INCLUDED IN YOUR ORDER COMPLETION EMAIL! Not only do I want to thank you & your team for everything that you do but I wanted to thank you personally. You took the time to talk to me for over an hour. You brightened my day when I was feeling hopeless. It’s such a comfort to know you & the ICN are there for support.